By Badrul H. Khan, Ph.D.
Based on the size and scope of the project, the number of individuals involved in various stages of an e-learning project may vary. Some roles and responsibilities may overlap as many e-learning tasks are interrelated and interdependent. A large-sized e-learning project may require the involvement of various individuals with unique roles for each. In a small or medium-sized e-learning project, some individuals may well be able to perform multiple roles. Each e-learning initiative is unique. It can either be a one-person project, or one person may even play multiple roles, with differing responsibilities required for each role. However many of us in academia and business single-handedly develop online courses, with only intermittent help from others. When an e-learning course is completely designed, developed, taught and managed by a single individual, it is clear that the same individual fills the role of a content expert (or subject matter expert), instructional designer, programmer, graphic artist, project manager, etc. The process of creating quality e-learning products begins with a comprehensive analysis of learners, learning content, and context and ends with performing a quality check. The final product is then ready for delivery to the client.The e-learning process includes several stages: analysis, planning, design, development, delivery, and evaluation (see Figure 1). The process is iterative, taking corrective feedback and incorporating it into the various stages. Individuals involved in the e-learning process should be in contact with each other on a regular basis and revise materials whenever necessary. It is important to note that although different people may use different terms for the e-learning stages (i.e., planning, analysis, etc. ), each stage of the process must be followed to completion. 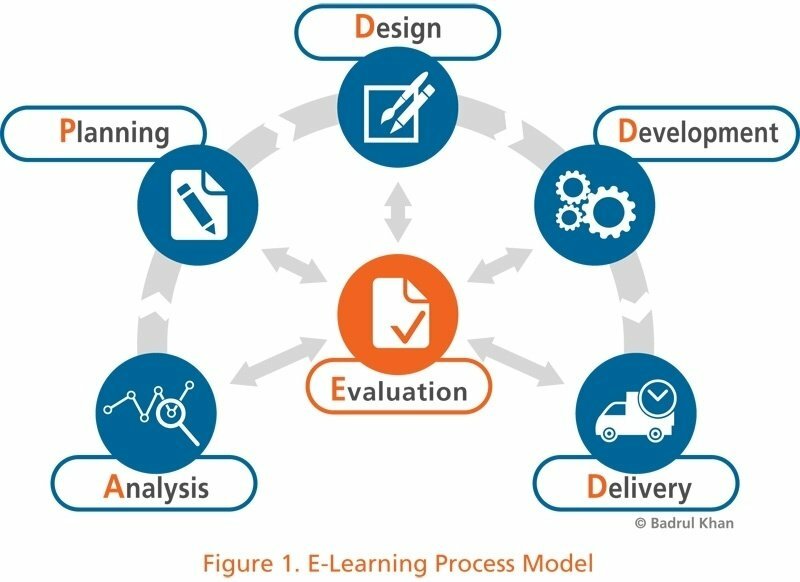 Ongoing evaluation for improvement (i.e., revision) should always be embedded within each stage of the e-learning process (please note that “evaluation” is shown in both phases of the process in Figure 2). The e-learning process can be divided into two major phases: (1) Content Preparation and (2) Content Implementation (see Figure 2). In this article, various e-learning activities are briefly introduced. During the content preparation phase all e-learning materials are designed based on instructional design principles and produced following a plan that implements those principles to create meaningful learning activities. The content preparation phase consists of activities including analysis, planning, design, development, and evaluation. The analysis stage consists of analyzing the "who, what, where, why, and by whom" of e-learning. At this stage, learning goals and objectives are established and the attributes of existing learning context and learners’ knowledge and skills are identified. It is therefore a broad process and contains many diverse activities: needs analysis, learner or target audience analysis, context analysis, task analysis, content analysis, and media selection analysis. Based on results and information from the “analysis” stage, a comprehensive e-learning plan can be developed which should serve as a ‘road map’ that shows the practical steps to develop the learning materials needed to achieve organizational e-learning goals. The design of e-learning follows a logical and orderly method of organizing course contents with learning objectives, relevant learning strategies, assessment instruments, exercises, and delivery media. During the implementation phase all e-content is distributed to or is accessible by its stakeholder groups at anytime from anywhere in the world. In this phase, all e-learning content is uploaded to the server (usually all e-content is hosted on LMSs - Learning Management Systems or LCMSs – . All supplemental course materials (e.g., CD, DVD, audio and video cassette, book, course pack, etc.) are also delivered to its stakeholder groups. Before offering an e-learning course to its target population, an institution should have an efficient administrative system to register students, experienced technical support system to maintain/update e-learning content, effective market strategies to attract customers, and generate sales with great return on investment. 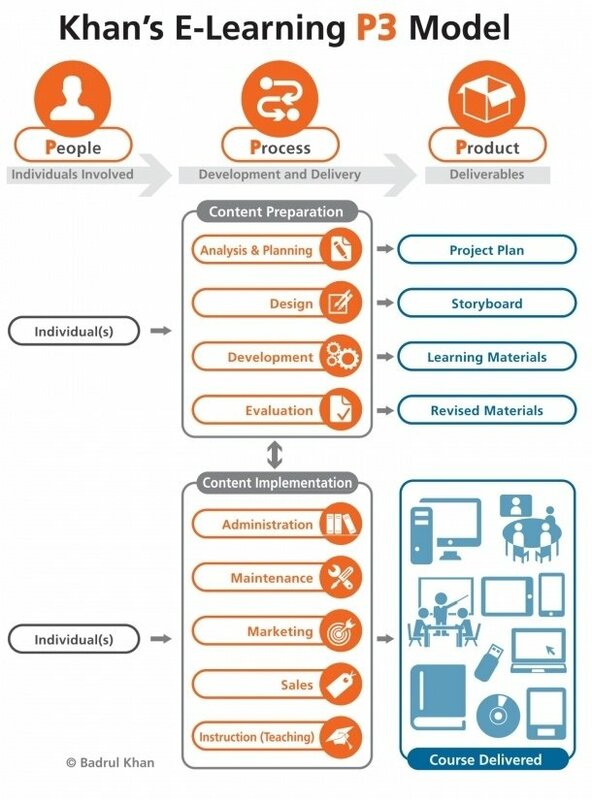 The content implementation phase consists of activities including: administration, maintenance, marketing, sales of learning products and instructional / learning environment (see Figure 2). Institution should have a procedure for training instructors and facilitators on course curriculum, learning outcomes, method of delivery, and testing procedures. Similar procedures should be in place for technical and other support staff (e.g., library staff, counselor, etc.) and students. Course enrollment and registration are major administrative tasks for e-learning. Institution must employ a robust system of updating and monitoring of all e-learning materials on a regular basis. During this stage it is critical that all internal and external links and resources are active, and all security measures are in place. Like any new and innovative products or services, e-learning also needs marketing to let potential customers know what’s available to attract both inside and outside customers, and keep them satisfied and enthusiastic for coming back for more. There are two types of marketing involved in e-learning: internal marketing for inside customers and external marketing for outside customers. Inside customers are individuals within the organization who have stakes in e-learning (e.g., instructors, trainers, training sponsors, and other support staff). They need to buy into the idea that e-learning is flexible, efficient, high quality, and meaningful; and provides great return on investment (ROI) for both its stakeholders and the organization. That’s internal marketing!On the other hand, outside customers are consumers of education and training services (i.e., students) who must be well-informed about what they receive are truly high quality and meaningful products, and they must also realize their investments are worthwhile. Educational and training providers should market vigorously to their consumers as the market is very competitive. That’s external marketing! Sales can be two types in e-learning: internal sales and external sales. The term “Sales” in e-learning may be confusing to some organizations when it comes to training within their own organizations. In reality, e-learning products and services that are used to train individuals within an organization are paid by a specific funds in the organization such as Human Resources (HR) Office. HR sells training to other branches in an organization. At the end of the fiscal year, HR may calculate how much spent and how much earned! That’s internal sales. On the other hand, when academic and training institution sell e-learning courses, certificates and programs to its consumers, that’s external sales. Engagement occurs when students are actually receiving instruction and facilitation. At the course instruction stage, instructional (e.g., Instructor, tutor, course facilitator, discussion moderator, trainers, etc.) and support services staff (e.g., technical support, librarian, counselor, etc.) are involved. People involved in step by step process of e-learning activities produce e-learning materials (see Figure 3). At the analysis and planning stages, individual(s) involved should develop a project plan by analyzing various aspects of e-learning issues. The project plan should clearly identify the people, process, and product for each stage of the e-learning. In addition, the plan should indicate the estimated completion time for each task. At the course production stage, course learning materials are created based on the storyboard codeveloped during the design phase. Thus course materials ready for pilot testing (see Figure 3). By conducting ongoing formative evaluation, we can improve the e-learning product as it is being developed. Summative evaluation is usually conducted to do the final assessment of e-learning products. However, e-learning projects undergo ongoing evaluation for improvement. Therefore, formative evaluation is inherent in e-learning development process. Learners’ feedback from the pilot testing can be analyzed to revise the course materials. The product of the evaluation process is revised course materials which are ready to be offered to learners. All online course materials should be accessible by the learners at anytime from anywhere in the world. The product of the implementation phase is course delivered, a set of well-maintained learning materials available for registration.